Home Baby	When Do Babies Sit Up? As a new parent or a second, third, or fourth time parent, this is a phrase we hear a lot from our OB or midwife, the pediatrician, your child’s teacher… Everyone. It is such a reoccurring phrase because it is so true! Every child is different. Some children will learn to walk at nine months old while others won’t until they are well past their first birthday. Some children will start talking at 8 months and their sibling may not start talking until 13 months. Every single child is their own person. They have their own personalities, temperaments, and bodies, all of which affect their development. So we need to remember that when we asses our child’s development. As a parent with a new baby, a big question is when can babies sit up on their own? When can babies sit up on their own? Well, just like with any milestone this will vary from baby to baby. If only babies came with a manual that said something like, ‘your child will sit up when they are five and a half months old and take their first steps 4 months later so have your camera ready.’ That would be great, wouldn’t it? Well, unfortunately, babies don’t come with a manual so we have to have approximations. The average child sits up between 4 and 7 months. So what leads up to answering the question when can babies sit up? First, we need to understand the developmental milestones a baby will reach throughout those precious first few months. There are several categories of development that we focus on for babies. Communication, social-emotional and physical. Social-emotional and communication development involve cooing, a social smile and so many other priceless new skills your baby will learn. Physical development is broken into two categories; gross motor and fine motor. Fine motor development refers to small muscle groups like the ability to pinch your fingers or control your wrist. There are a lot of activities for your baby to do a little later on to develop their fine motor skills. Like playing with a ring stacking toy or puzzles. This motor development will help your child eventually learn to hold a spoon, write their name and pick up small objects. Gross motor, on the other hand, refers to large movements such as walking, crawling, or sitting. 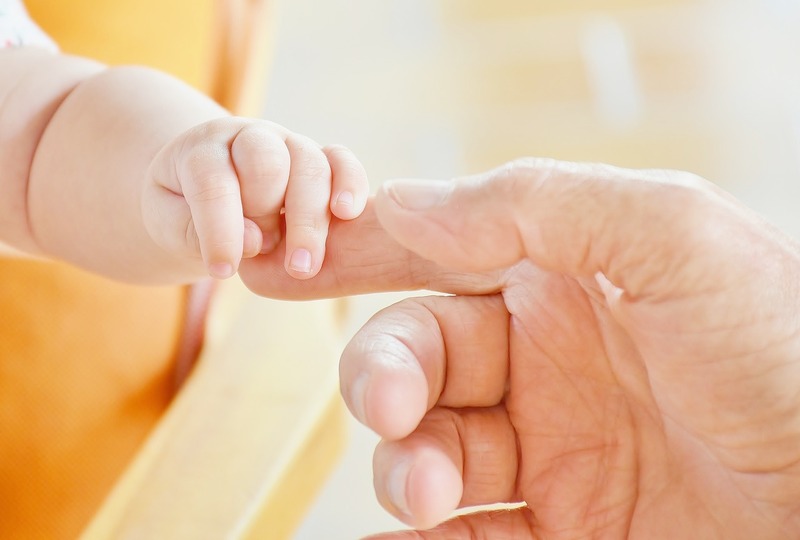 The gross motor skills a baby learns will be used for the rest of their lives. For example, the gross motor skills that babies learn during their first years of life will lead to all their abilities in later life. From running to jumping to more controlled movements like ice skating or hurtling. But before your baby can start winning state championships for the high jump they will need to learn to sit up on their own. How To Know Your Baby Is Ready To Sit Up On Their Own? The ability to hold their head up on their own is one of the most important precursors to sitting up unassisted. If a baby cannot hold their head up steadily while sitting up, then their breathing may be compromised and it is very dangerous. So strong neck movements and control are extremely important for a baby to learn prior to learning to sit up. Most babies by 4 months old can hold their head steady. Once your baby can hold their head up, this is a great sign that they are ready to start sitting up with support, like in a Bumbo chair. Sitting up with assistance is the first step your baby will take in learning to sit up on their own. How can you encourage your baby to sit up? I just want to reiterate they need to be able to hold their head up steadily without any assistance before they can sit up on their own safely. One of the first gross motor milestones that a baby will come to is holding their head up. To help a baby meet this milestone there are several activities you can do. The two-word phrase every new parent will become very familiar with is tummy time. Tummy time is an important playtime activity for a newborn to build strength all over their body. This will help your baby gain the muscle strength and coordination to hold their head up on their own, then roll over and eventually sit up on their own. Tummy time is exactly what it sounds like…it is time your baby spends on their tummy. When your baby is lying on their tummy they are forced to lift their head off of the floor to look at the world around them. This activity develops the neck and back muscles your baby will need to sit up. My son hated tummy time in the beginning so a great alternative to just laying your baby on a play mat or on a blanket is to lay them on your chest. I would lie on the floor in the middle of my son’s nursery and have him lie on my chest. He felt more comfortable when he felt close to me and he still gained the valuable muscle strength associated with tummy time. Another sign that your baby is ready to start learning to sit up on their own is being able to sit up with assistance. There are tons of products on the market to support your little one as they learn to sit up. There is the Bumbo seat which is specifically designed to help babies sit up safely while they learn to sit up on their own. Or you can use a Boppy pillow which is great because it starts as a breastfeeding pillow, then it can be used for tummy time before you use it for sitting up. What May Be Discouraging Your Baby From Sitting Up? If a child isn’t encouraged to build up their muscles, they probably won’t. Some can be perfectly content to just sit in their car seat staring at mom’s face all day long. For your baby, there is no better place in the world to be than being propped up looking at a loved one. And, yes some babies completely hate tummy time so it’s hard to make them build up those little muscles. And boy do I get it! I hate working out too. But, babies really need tummy time to strengthen their muscles. When a baby spends too much time strapped into their car seat or sitting in a swing it will discourage them from learning to sit up on their own. Because, why would they? They are already at the perfect angle to see the world around them and see their favorite people in the world. So, we always want to encourage our babies to sit up and learn to lift their heads through tummy time and other activities. I remember the first time I had my son sit in his Bumbo seat. It made me feel like my baby just grew up overnight. After my maternity leave ended, I started working back in the office part-time and working from home part-time. I have the best boss ever and I was allowed to bring my son to work with me. I would put his Bumbo seat on my desk and my son loved sitting in it looking at everyone in my office and watching mom work. Everyone at my office started referring to my son as “the boss” because he looked like a mini CEO sitting in his little seat up on my desk. A Bumbo seat is a great way to teach your child how to sit until they are ready to do it on their own. Once they have mastered sitting up while being supported, next comes the “tripod sit”. This is where your baby will sit up with the legs in front of them and use their arms for extra balance. So their little body forms what looks like a tripod. At this point, a lot of changes are coming. This is because your child is on the brink of being mobile and can grab anything within reach. So if you haven’t baby-proofed yet now is the time! In the blink of an eye, they will be crawling. I often see my son bee-lining for things that could be dangerous, it’s like he just knows. What If Your Baby Isn’t Sitting Up? Don’t panic if your baby isn’t sitting up as soon or as quickly as you would like them to, remember my entire intro? All babies are different! Now, this doesn’t mean that if your baby starts missing milestones you should simply ignore it and hope it gets better. Try adding in another 30 mins of tummy time a day. Or, maybe try getting your child an activity mat so there is something enticing them to look around and building their muscles. If you have real concerns about your baby’s development it is always better to consult your child’s pediatrician. They will be able to guide you and work with your baby to get them back on track. But, always keep in mind every child is different and monthly milestones are based on averages. It’s amazing how quickly my son will learn something that I have been worrying about for months. One big one in our house was pointing. My son wouldn’t point at all and I was worried about it. I started pointing at everything I possibly could to get him to learn it. And guess what? He points nonstop now. To the point where he uses it against us. For example, the other day my husband was watching my son when my son bumped his head. Full on hysterics ensued so I come running from the other room and picked him up. He immediately stopped crying, made the most dramatic facial expression I have ever seen, points at my husband and starts crying again. I thought it was hilarious but my husband felt pretty bad. It is amazing how much we are wrapped around that little pointing finger now. Your Baby Can Sit Up, Now What? Now that your baby can sit up, mobility is just within reach. Pretty soon they will learn to start balancing on their hands and knees. Which will lead to them rocking back and forth on their hands and knees. And, before you know it they are off and crawling all over the place. The human body is a remarkable thing. We double or even triple our size in the first year of life. We go from helpless newborns to Mr. Independent toddlers, all in the space of 12 months. It is an incredible journey to witness. But, it is also really scary as a first time parent to see your baby start to venture out into the world. Exploring all the nooks and crannies in your home and taking in the world around them. Those first twelve months are a haze of sleepless nights, late night feedings, wellness visits, tears of joy and frustration, first words, first steps and so many other amazing things. The learning curve of a first-time parent is basically a 90-degree angle. The learning “curve” is more like a straight line up. You are constantly asking yourself “how often should I be feeding my baby” “when will my baby sit up” “am I doing the right thing” etc. Every new parent asks all these questions of themselves and every new parent eventually figures it all out. Well, sort of, anyway. Those first nights home away from the help of the maternity or NICU nurses and doctors can be scary. I know I asked myself many times “how on earth am I going to do this?” But, you know what? I figured it out as I went and I still am. The first year goes by in a flash so remember don’t blink.